Interior Minister Rehman Malik lie is exposed once again about the presence of Black water in Pakistan. few months ago Rehman Malik said in a interview if Presence of Black water is proved in Pakistan i will resign from my ministry. Yesterday American Secretary of state Robert gates in an interview on Express news accepted that Black water is operating inside Pakistan. 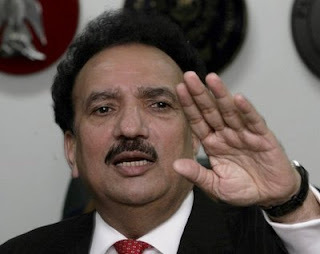 now as the lie of Rehman Malik is exposed once again he must fulfill his promise and resign and if he is not going to resign there is no need to worry because in next few days Supreme court of Pakistan will remove him in NRO case.